A promising Finnish rock combo founded by an accordionist Harri KUUSIJÄRVI have launched the second album titled "Music For A Family Picnic" in February 2017. 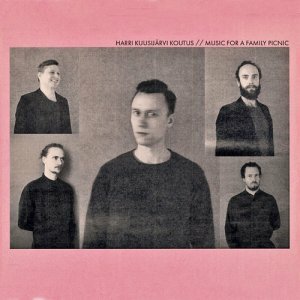 Harri says he (maybe) always changes the combo formation for creating soundscape different from previous ones ... his musical collective would be amorphous for realization of music-spherical diversity. Kinda indescribable chamber soundscape filled with mysterious accordion-based cotton candy is flowing over the audience. Their (his) sound texture and melody lines are walking around between realism and ambience like a creature of fancy. On another side we can hear monotonous, inorganic cold grey turf. Quite interesting, impressive is such an excessive sound contrast and complete coexistence. The titled track is a colourful one ... drenched in cynical identity against pop but simple melody threads wound upon a song spool, no difficulty, no shoulder pain. And as for progressive rock-oriented atmosphere, a track with a meaningful (and looong) appearance "I Was Driving 160 Miles Per Hour From Turku In The Midnight When I Felt The Time Was Slowing Down" has definitely heavy / metallic elements of King Crimson or psychic ones of Pink Floyd. Harri's accordion play sometimes stands up at the very front and sometimes sits down behind the all instruments. He can be mentioned as the forward and as the goalkeeper ... namely the key player. Awesome really.